They talk big, they act big and above all they spend big. When it comes to spending nobody can match mafiosi. The stories are legion about Al Capone buying all of a newsboy's papers and sending him home with a $20, or $50 bill, or tipping a waitress $100 for a cup of coffee. Since then, mafiosi big and small have tried to live up to Capone's standards. It is a matter not merely of imitation, but rather of behavior that goes with the territory. Mafiosi live a life that demands "respect," but such respect often can only be measured in money, and thus it is natural for them to live high and spend big. To them it means having "class." Once Carmine "the Snake" Persico, a power in Brooklyn, handed a waiter $50 in payment for a check that came to something like $5. "I'll have to get your change, sir," the waiter, looking at the denomination, said. "Did I ask for change?" Persico asked, in a tone somewhere between magnanimity and annoyance. Mobsters are notorious overtippers. As a rule, informer Vinnie Teresa said, mobsters give at least 25 or 30 percent as a tip. Henry Tamelo, the underboss of the New England mob, who later went to the death house on murder charges, gave 50 percent. "When he walked into a club, the waiters were busy throwing customers out of a booth to find him a seat." Teresa explained why mobsters liked to dress up in $500 silk suits, $100-plus shoes, travel in luxurious cars, and parade into fancy places with beautiful women on their arms. "Ninety percent of all mob guys come from poverty. They grew up with holes in their pants, no shoes on their feet. They had rats in their rooms and they had to fight for a scrap of bread to eat. Now they made it." Some mobsters would wonder what their lives were all about if they could not be ostentatious. No one could convince Chicago crime boss Tony Accardo to live in anything less than a 22-room mansion that sported an indoor pool, two bowling alleys and a pipe organ. The bathroom fixtures, all goldplated, were valued at a half million dollars. On the other hand crime boss Joe Colombo's platinum-blonde wife never overdressed. As a sympathetic friend once remarked: "Poor Lucille has to walk around in rags because of those IRS jerks." Colombo learned that bit of personal restraint from his predecessor, Joe Profaci, who was known to his underlings as a man of exceedingly "short arms"— not the sort to part easily with a buck. Waiters were lucky to get 10 percent from Profaci, but, on the other hand, he gave a fortune to the collection plate of the Catholic Church. So too did Chicago's psychopathic Sam Giancana, who was never known to put less than several hundred dollars in the envelope at mass. Giancana was not so stupid as to think he was buying himself absolution. He did it for his very devout wife. When his wife died, he donated a communion rail for St. Bernardine Church in Forest Park, Illinois, in her memory. It cost, the FBI reported, $13,000. One reason mobsters spend so much, Teresa reported, was that they figure the money will keep coming. Teresa himself made something like $10 million in a 28-year crime career, but also spent "all I made like there was no tomorrow." At the top of the crime ladder a surprising number of bigwigs feel no compulsion to spend big, feeling they have no need to prove themselves to others or even to themselves any more. 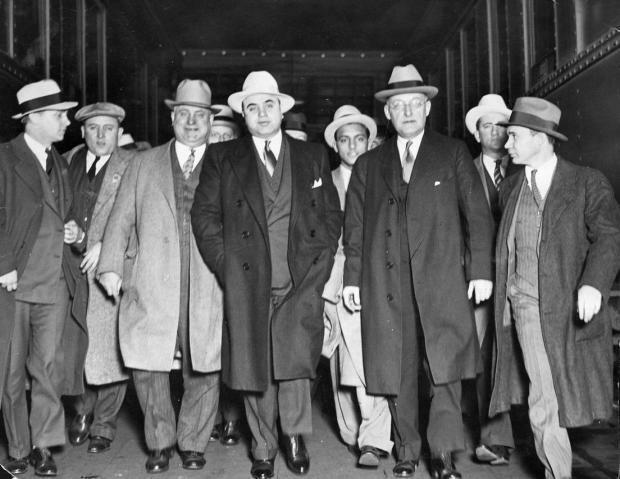 Lucky Luciano dropped the loud dress, which marked, for example, members of Chicago's Capone Mob, in favor of the refined attire of a gentleman. It was no easy task. His mentor Arnold Rothstein once told him, "I want you to wear something conservative and elegant, made by a genteel tailor." Luciano was taken aback. "What the hell are you talkin' about?" he replied. "My tailor's a Catholic." Rothstein curbed Luciano's extravagant spending habits as well, explaining to him that the very rich don't overspend and overtip to get respect. A wageearner group ever after disappointed with Luciano's spending style was Polly Adler's hookers. If a prostitute thought her sojourn to the Waldorf Towers for a session with Luciano was going to pay her much more than the then going rate of $20, she was sadly disappointed. At most Lucky would slip a $5 bonus in her brassiere as she dressed. "I didn't want to do nothin' different," he said. "What do you think I was gonna do—spoil it for everybody?" Meyer Lansky would have been hard to spot as an organized crime big spender. Before his flight to Israel, home for Lansky was a modest three-bedroom ranchstyle house in Hallandale, Florida. He walked the family dog (described by some biographers as the ugliest dog in captivity), rented Chevrolets and spent most nights at home with his wife. He never flaunted his wealth, estimated to be as much as $400 million, because he always thought back to his associates who did—Luciano, Frank Costello, Vito Genovese, Louis Lepke, Joey Adonis, Bugsy Siegel, Mickey Cohen and Albert Anastasia—and observed they all wound up imprisoned, deposed, deported, executed or assassinated. Lansky could be a handsome tipper however, at least when dining alone or with friends. Whenever he dined with his wife, he was careful to keep his tipping moderate. Probably the greatest joy for a mob spender occurs on a visit back to the old country, generally to an impoverished village. In 1927, Frank Costello, already a racket millionaire, returned to the village of Lauropoli, an obscure hill town in Calabria, Italy. One by one Frank's sister introduced them, and for each she had a tale of woe. "His wife needs an operation." "He wishes to send his son to school to learn a trade." "A landslide destroyed his crops." "Her husband died suddenly and left her with two small children." And so it went until the line was exhausted. It was in Lauropoli that Costello made his grandest buy of all. A mousy little man approached and handed him a piece of paper, explaining it was an IOU signed by his mother. He had given her two sacks of flour on account, and she had left for America without paying him. Costello recognized his mother's handwriting and not only redeemed the IOU but paid handsomely in interest for the intervening 35 years. "I never wanted a piece of paper so bad in my life," he told a friend years later. "The old bat nagged me to death all my life. It was always: 'Frank, why don't you get out of the rackets?' or 'Frank, why don't you go straight?' She always swore she never did anything wrong in her life. I wanted that piece of paper to show her how she had beat this poor old guy out of two sacks of flour.